Liz's Paper Loft: Guest Designer: Amy! Hello everyone!! I am excited to be today's guest designer for Liz here at Liz's Paper Loft. My name is Amy and I have a blog called Scrapping Mommy. I have known Liz, through blogging, for a couple of years now and I just love her style. I also recently joined her on the super talented My Creative Time design team. Since Liz didn't get to share with you the new release at My Creative Time (which I know she really is so sad to miss), I am going to share a card that I made with the new You Are Perk-fect stamp set. I used my Cricut and the Love you a Latte cartridge to cut out this to-go coffee cup. I welded two of the cups together in Cricut Craft Room and then sewed all the edges together with my sewing machine. The label is cut and stamped from My Creative Time's Fancy Frame Stamp & Die Set. I then stamped the sentiment along with two of the cute little coffee beans inside of that and adhered it to the front of the cup with some dimensional adhesive. I added a smaller to-go coffee cup to slip inside the two larger ones and added then the lid to the top of it so that it could easily be pulled out. I also stamped another sentiment from the You Are Perk-fect stamp set to the inside of the card and tied the top off with some Cappuccino bakers twine from The Twinery. So, I hear that Liz has some exciting news to share with you, but not quite yet. However, in the meantime, while she's recovering, she is reading every comment! Not only is she reading them, she's counting them, because at the end of all this, she will have two announcements! The first will be a winner of some exciting BLOG CANDY! The second, it's a big one...and no, she's not coming out with stamps...you just have to wait and see! Thanks Liz for letting me come and participate as a guest designer on your blog today!! Amy, thank you so much for filling in for me and creating this ADORABLE card! This would make a perfect invite for friends to get together for coffee! I wish you a speedy recovery from your surgery. Hope you're crafting soon. Amy has done a great job! Wishing you a speedy recovery! This is so cute! I love the red and polka dots! What an ADORABLE card Amy!!! LOVE the colors you picked, the stitching, and embossing!!! Amy ~ Oh My GOSH! This card is just PERFECTION! The colors are just AMAZING but the idea beyond CLEVER! So lifting this idea! I JUST LOVE it! Miss Liz ~ I hope you are feeling so much BETTER! I can't wait to see what you do with this release as well! Wonderful coffee card! I like the polka dot paper and the button and twine. This is so super duper adorable!!!! Thanks for sharing!! Fabulously cute card!! Love the label, the polka dots!! How fun...I just love the polka dot paper. 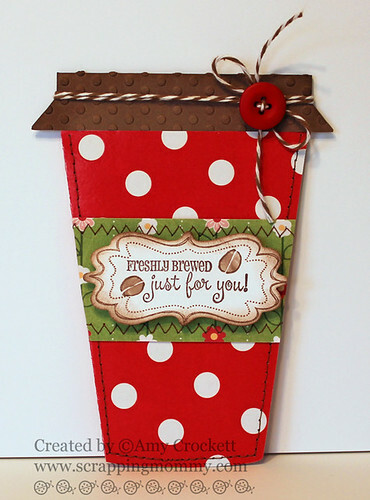 I especially love the red and brown together-so cute and such a fun card!! TFS! 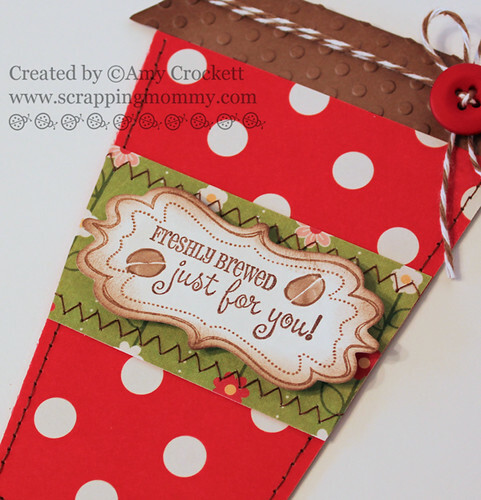 Super cute card, love the stitching and the fun colors you used! Great card with great colors too! Wow, this is great! Nice job! 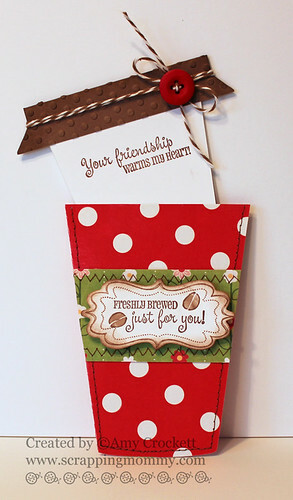 oh i love this coffee cup card!!! I hope Liz is recovering nicely and quickly! Oh how cute! What a gorgeous card with such beautiful colors! I love love loveeeeeeee this it is adorable.. what a great way to make a card. i'll have to try sometime. How cute is this design? Liz...your guest designers are really doing you proud!! I am just catching up on the past posts and I am beyond amazed at the talent!